Tucked away in a small triangle at the intersection of Peachtree Street and West Peachtree Street, Pershing Point Park, is a World War I memorial dedicated to the fallen heroes from Fulton County. This little known memorial has stood since 1920. Pershing Point Park was named for General John J. Pershing, Commander of the American Expeditionary Forces of World War I. It was December 3, 1918 that the Atlanta Parks Commission officially honored Pershing bestowing the triangular park with his namesake. 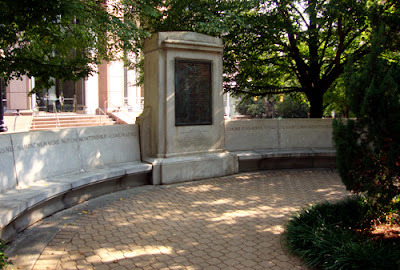 On September 20, 1920, the War Mothers' Service Star Legion, a group of mothers, sisters and wives of servicemen, dedicated the memorial, which lists the name of each soldier lost during the War. Thanks for sharing your photos, Terry. And for the tidbit about the names of battlefields being carved in the benches...didn't know that! See you at Dragon*Con this weekend!